I’ll never get rich scribbling for a living. When it’s time for me to starve to death in a loft, I’ll have to hit up one of my lawyer/doctor/banker friends and beg a long weekend. Every now and then, however, a gig comes along that makes it all pay off big time. Like this one, from a magazine that covers natural health: Take some cooking classes and write about your experience. The magazine will pay for the classes, and then will pay you for the column. As the kids say, that’s so awesome sauce. And so I asked around and found a series of beginning cooking classes at the Prep Kitchen Essentials in Orange County, taught by Chef Elizabeth Whitt, a graduate of Le Cordon Bleu in Paris. I missed the first week because my kids and I were felled with the killer flu. The second week I couldn’t find the place, because my sense of direction is about as bad as my sense of seasoning, and I ran in half an hour late. I cursed myself for even taking this assignment. See? The universe does not want me to learn how to cook, I told myself. It’s futile. It’s stupid for me to even doing this. And I should be home working anyway. For the full-report, you’ll have to wait until whenever the piece is published and buy the magazine. But I will tell you this: for probably the first time I can remember, I was in the company of people whose knife skills were worse than my own. And when one woman pressed the knife down on a carrot and accidentally shot it across the room, I was greatly heartened. But the list of dishes we would be learning how to prepare weren’t so elementary. One in particular worried me. Braised chicken with mushroom and leek cream sauce. The title of this recipe didn’t inspire any excitement or anticipation. Chicken is already meh in my book, and the words “mushroom and leek sauce” don’t exactly make my mouth water either. And cream? Mushroom and Leek Cream sauce? That would have sent me running for the bathroom in my first trimester of either pregnancy. Even now, visions of cream of chicken soup (or as my kids call it, “rice with chicken crap,”) burble up from my deep within my subconscious, where I was hoping to keep them locked up and out of earshot for the rest of my days. But, that’s what we were making. Which meant that it’s what we’d be eating at the end of the class. And wow. Apparently you CAN infuse a dish with incredible flavor if you know what to do with it. Who knew? But then I guess that’s the point of cooking classes, right? Heat a large Dutch oven and add oil. Wash and pat chicken thighs dry with a paper towel, and season with salt and pepper. Sear thighs in the hot pot on medium high heat until golden brown on at least one side. The Chef threw half in and let them sit there for a while, which made me twitch, but I think she knows what she’s doing. “We’re searing in the flavor,” she told me. Promise? Because I’d be burning my house down. OK. I stopped talking and watched. Remove the chicken and set it on a separate plate until needed. 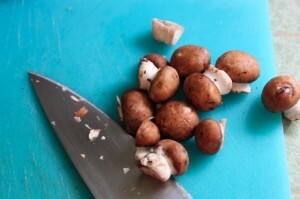 Add shallots, mushrooms and leeks and season with salt and pepper, saute until tender on medium eat, about 5 minutes. Add garlic and flour and stir to make sure flour evenly coats vegetables. Remove the bouquet garni and discard. (At this point the dish can be cooled and refrigerated for up to three days. Reheat in oven or on stove top.) When ready to serve, stir in lemon juice, zest, sour cream and taste sauce for seasoning. Add fresh herbs and adjust seasonings before serving. Do you believe I actually made this? Do you believe it actually turned out? Turned out well? I cooked this up the next month for my friend Debbie, and managed to recreate it in my own kitchen, with no professional watching over me. Three thumbs up from Debs. Ran a portion over to the Carnivore, and got a text with one hundred exclamation marks the next day lunch. Maybe I can be taught after all. And at any rate, I now know what a bouquet garni is. And I’ll use it in a sentence one day soon. I don’t think I know how to brown meat either. With stews and stuff I often do it half-heartedly, but I recently learned that it’s actually important for flavor. It’s a drag though, whenever I attempt to actually brown anything besides a steak I always end up having to dismantle my smoke detector midway.